Definition at line 412 of file GVNExpression.h. Definition at line 433 of file GVNExpression.h. Definition at line 432 of file GVNExpression.h. Definition at line 419 of file GVNExpression.h. 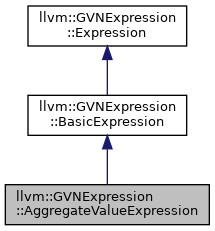 Definition at line 450 of file GVNExpression.h. References llvm::BumpPtrAllocatorImpl< AllocatorT, SlabSize, SizeThreshold >::Allocate(), and assert(). Definition at line 428 of file GVNExpression.h. Definition at line 455 of file GVNExpression.h. References llvm::lltok::equal, llvm::GVNExpression::BasicExpression::equals(), and int_op_begin(). Definition at line 463 of file GVNExpression.h. References llvm::GVNExpression::BasicExpression::getHashValue(), llvm::hash_combine(), and llvm::hash_combine_range(). Definition at line 435 of file GVNExpression.h. Definition at line 437 of file GVNExpression.h. Definition at line 442 of file GVNExpression.h. Definition at line 436 of file GVNExpression.h. Definition at line 438 of file GVNExpression.h. Definition at line 443 of file GVNExpression.h. Definition at line 441 of file GVNExpression.h. Definition at line 469 of file GVNExpression.h.